I now carry the Daiwa One Touch folding nets. Please note that Daiwa's new One Touch nets are not the same as the One Touch nets I carried before switching to the Shimano nets a few years ago. The Shimano Folding Net is a net for people who think nets just get in the way. This one doesn't. 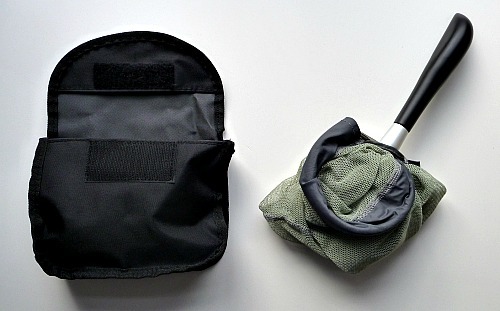 It collapses and fits in a pouch on your belt. One of the advantages of a tenkara rod over a fly rod is the ease with which you can collapse the rod when you need to walk through streamside brush. This net has the same advantage. A tenkara net, tucked into your belt, catches on brush less than a western net, but it still does catch on brush. And when you sit on a rock for a lunch break, it's bottom hits the rock before yours does. Not with this net. If you fish with a backpack, which I do, a net tucked into your belt is always in the way - you can't move it quite far enough back because it hits the side of your pack. The Shimano Folding Net is out of the way and fits perfectly - at your side and alongside the pack. 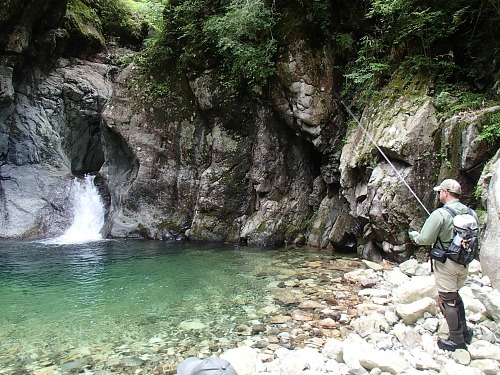 When John Vetterli went to Japan (above), he took his Shimano Folding Net. You can see it at his side - out of the way but easily accessible. The photo below is of an earlier model of the Daiwa One Touch, not the Shimano Folding Net. The principle behind the two nets is exactly the same. The hoop is made from spring steel, and you can collapse it by twisting it (see photo session below). I used a photo of the Daiwa net because I could not get the Shimano to sit like that all folded up. Upon removal from the pouch, it always immediately sprung open. The Daiwa, at minimum, required a sharp flick of the wrist - sometimes two or three - to get it to open. The immediate auto-open feature of the Shimano is probably reason enough to choose it over the Daiwa. When you are trying to get a fish in the net, all the while trying to keep your rod tip out of the overhead branches and your feet solidly under you on slippery rocks, you really don't want to have to deal with a net that won't open. To fold the Shimano net, hold the handle with your left hand (thumb pointing down) hold the other end of the frame with your right hand (thumb pointing down). The net frame now is one big loop. Twist the net by rotating your right hand clockwise, so your right thumb is now pointing up. The net frame is now two loops. Slide the portion of the net hoop that is by your right thumb OVER the portion of the frame that is by your left index finger. 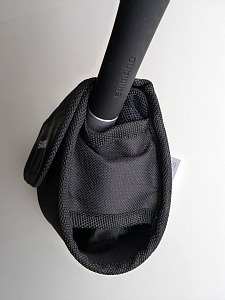 Hold all three loops together, gather up the net bag, insert the folded net into the holster and secure the velcro flap. The grip on the Shimano is made from or at least coated with what seems to be the same material Shimano used for the non-skid coating on its Kozuka NT rods and that Suntech uses on the Kurenai HM30R. It is smooth and doesn't feel like it ought to be non-skid, but it is. 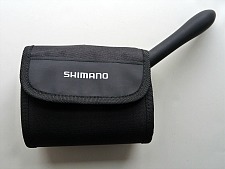 The grip on the Shimano Folding Net is a bit over 6" long. Although that is considerably shorter than the grip on the TiNet, I don't think I have lost one fish because of the shorter grip. My line and tippet together are generally just long enough that I have to hand line a fish in at least a little, and having to bring it in just a few inches closer has not mattered. In practice, there is big a difference when going through brush or sitting down, but not so big a difference when netting a fish. 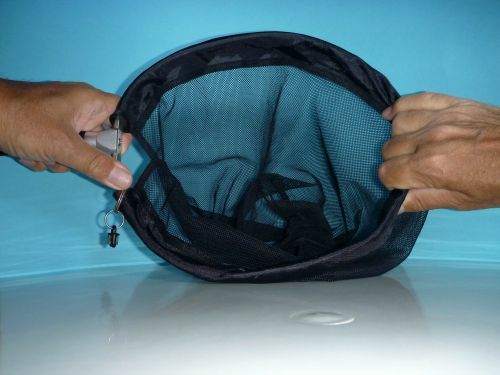 The Shimano Folding Net pouch is semi-rigid so it is easy to get the folded net back into the pouch. Also, there are large openings for ventilation. Still, I would recommend drying the net thoroughly outside of the pouch before storing it away between fishing trips. All in all, the Shimano Folding Net is a well designed net that is there when you need it and out of the way when you don't. It is the nicest folding net I've seen. The Shimano Folding Nets weigh 8.4 ounces (25cm) and 9.2 ounces (30cm). This has become my primary net. I love these nets. The net I ordered on Monday and received Weds.. :) works fabulously.